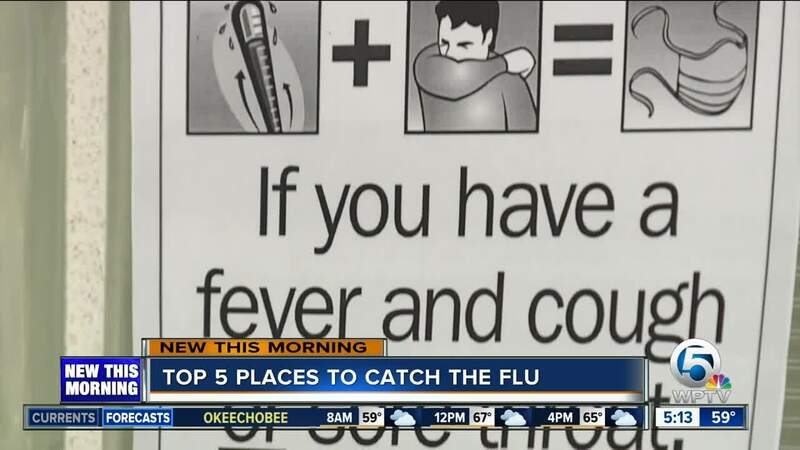 Doctors explain the top 5 places where you are most likely to catch the flu. JUPITER, Fla. — WPTV reporter Tory Dunnan says, "Call me crazy, but I'll do anything to avoid catching the flu, like not touching door handles." It turns out, this might be a pretty effective way to avoid getting sick. "It's been pretty rampant," said Dr. Lynda Bideau with Children's Physicians in Jupiter. "In one morning, five positive flu tests. However you want to describe it, everyone can agree that you don't want to get catch the flu. "Concentration of a lot of people in one area, breathing the same air (are places where the flu can be spread easily)," said Bideau. So, how do you avoid catching it if you have to go to the doctor for something else? "Arriving early in the morning before a lot of sick kids are in," said Bideau. "Or later in the day when mostly everybody is gone." The problem is, it's not only where you go, it's what you touch along the way. "Countertops, door knobs, shopping carts," said Bideau. "But remember with the flu, it's mostly in the air." She recommends having antibacterial wipes handy and using them on your kids' hands as a way to try to prevent the flu. The best line of defense? Experts say get your flu shot.